This is an amazing way to convert an otherwise tough piece of meat into a mouth-watering delight that will have family and friends talking for a long time to come. Use a pestle and mortar to make the cure and start by grinding the black peppercorns, dried bay leaves and cloves. Add in the salt and give a little grind to reduce the size of the crystals. Add in the remaining seasonings and mix thoroughly. With the brisket in a large food bag, take the cure and coat evenly, not forgetting to coat the sides and ends. Place in the fridge for 3-4 days, turning it over every 12 hours. After the curing time, remove the brisket from the bag and wash thoroughly under cold running water. After rinsing the excess cure from the sink, put the brisket into the sink and fill with water to cover. With the brisket submerged, leave the cold tap running slowly and allow it to flow down the overflow. If you can’t do this, simply drain and refill the sink every 30 minutes. The brisket needs to soak for 1-2 hours. Remove from the water and pat dry. To make the rub, use a pestle and mortar again and start by grinding up the pink and black peppercorns. Add in the remaining dried herbs and spices and mix thoroughly. Coat the brisket all over, making sure to coat the sides and ends. Your brisket is now ready to hit the Smokey Mountain Cooker. To set up your Smokey Mountain Cooker put a layer of Weber Briquettes into the cooking ring, followed by the 12 Cherry Wood Chunks, another layer of Weber Briquettes, followed by the 12 Hickory Wood Chunks, followed by another layer of Weber Briquettes. 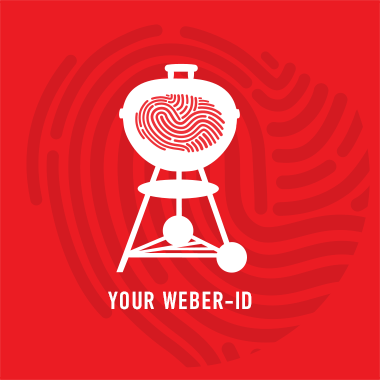 When you are ready to start cooking, fill a Weber Chimney Starter a third full with Weber Briquettes and light. When they are lit pour the Chimney Starter onto the top of the Briquette/Chuck layers and arrange in the centre. The lit Briquettes will slowly burn down through the layers of unlit Briquettes and Wood Chunks, extend the cooking time of the Smokey Mountain Cooker, and also help to regulate the temperature. Place the middle section of the Smokey Mountain Cooker onto the base and fill the water pan ¾’s of the way with cold water. Place the brisket onto either cooking grate, fat side up and place the lid on. Start with all 3 bottom vents and the top vent fully open. As the temperature rises and the unlit fuel begins to burn, you can regulate the airflow through the Cooker by partially closing the bottom vents. Do not fully close any of the bottom vents as this will starve the fire of oxygen, and do not alter the top vent as this should always be fully open. Check the water level of the pan every 2-3 hours and keep it topped up to the ¾ level. If the temperature of the Cooker is correct, top up with warm water, but if the Cooker is running hotter than you would like top up with cold water. Ideal cooking temperature is 90◦C-110◦C. After 6 hours, wrap your brisket in tin foil and return to the cooker and cook for a further 6 hours. Probe the brisket with a clean temperature probe and remove from the cooker when the internal temperature has reached 82◦C. Why not try adding a sauce to your steak sandwich: 1 tbsp barbecue sauce and 3tbsp mayonnaise. And a mixture of sautéed vegetables: 2 button mushrooms, sliced, ½ onion, sliced, 1 red pepper, cut into strips. Preheat the griddle pan on a medium to high heat. Drizzle with oil and sauté until the vegetables are softened.